St. John's will soon be host to an international conference of storytellers, with lovers of stories coming from across North America, Europe, the Middle East, Africa and Asia. 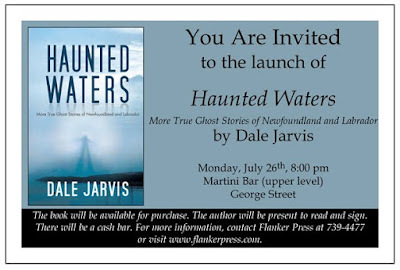 Local storyteller and author Dale Jarvis will start things off on Monday, July 26th with a pre-conference book launch. From an encounter with a shrieking horror on Signal Hill, St. John’s, to the legend of the headless pirate of Red Bay, Labrador, Jarvis has captured stories of white horses, men in black, haunted punts, vanishing boats, and things that go bump in the basement. Blending local history, folklore, eyewitness interviews, and archival research, Haunted Waters is the latest collection of ghostly tales from one of Canada’s finest, and creepiest, storytellers. The book launch will take place on Monday, July 16th at the Martini Bar (upstairs) on George Street at 8:00pm. The author will read from his book, and will be signing copies for sale.